The past two months rushed by once again. I'm working out at lunch three or four days a week, so there's not a lot of time for writing this stuff up. Today I had a meeting run into workout time or I would've been five for five this week. Instead, you get a quick blog post. I went to Costco to get supplies for 4th of July and ended up getting us season passes to Great America (and the included water park, and Gilroy Gardens) for OMG so cheap compared to Disneyland that we just went for it. So, SUnday afternoon instead of trying to entertain Athena around the house and prep for a party, we headed out and went to Great America. Athena rode her first bumper cars, enjoyed the double decker carousel, and rode the skyway (sky train) with Daddy. A lovely Independence Day was had starting with the Alameda 4th of July parade. Athena waved her little flag and then after about 15 minutes asked if it was over because she was bored. She and Cordelia made their own fun, which is a nifty place to be in life. There's a local elementary called Queerly Elementary that focuses on inclusion. I love this town. Along with the usual military displays, we also had a gun control group. Nice. We zipped on home and had our annual 4th of July party again this year. It was a slightly smaller crowd than last year, but that was good actually. Last year was just a little too much. This was perfect. I actually got to talk to everyone who showed up. Athena was thrilled to spend her day with her friends and Lorelei spent the night. All around it was a fabulous success. These two together is my favorite thing in the whole world. The following weekend was Sarah's Multi-Period Picnic, or as I started referring to it, the time-traveller's picnic. 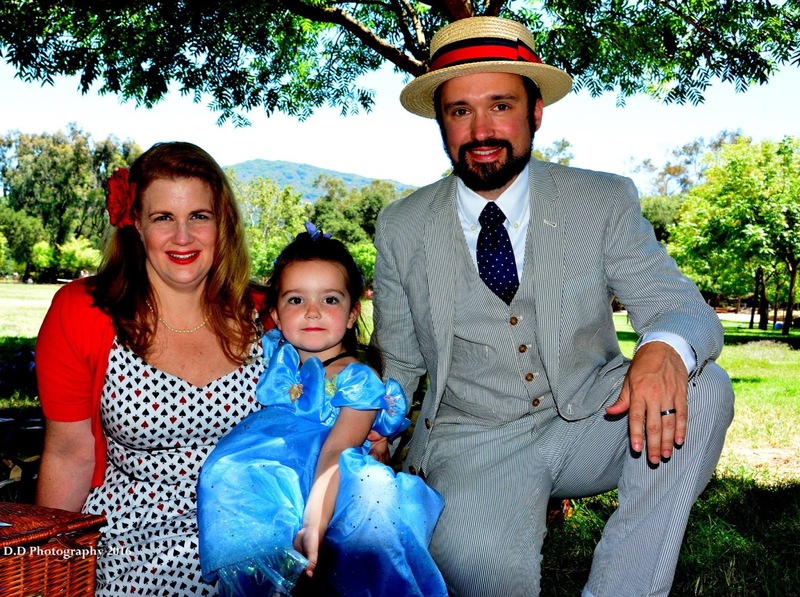 Held at Vasona/Oak Meadow Park in Los Gatos, the park is a favorite for us for its train and carousel. 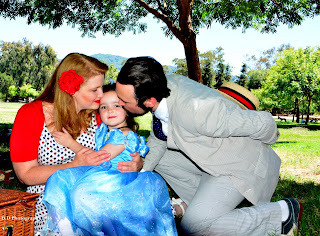 Athena decided to dress as Cinderella and Erik wore his seersucker suit and boater and I opted to go easy and do 50s. 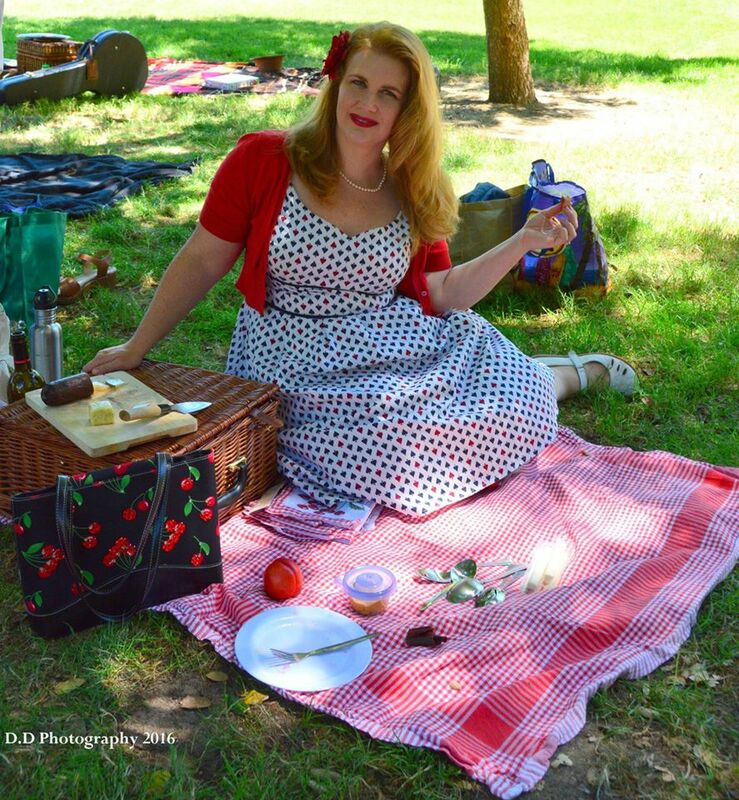 I looked up 50s makeup and realized it was remarkably like what I do daily. Then I looked up 50s hair, and found that was remarkably like my day to day hairstyle. So, um, yeah. Just opted to take it up a notch, wearing my Agent Carter lipstick, and actual foundation, and going for the ever so classic pearls, neutral nylons, and white hurache sandals. Athena has been taking swim lessons again, now at Saratoga Star Aquatics. She's loving it (again) and is just about ready to make the leap to being really able to swim unsupported. I'm really hoping we get there soon because drowning is definitely one of those big looming fears. Anyway, she's getting far more sanguine about splashing, which is good, because other kids playing could previously bring her to tears in the pool. We've more formally instituted a monthly sleepover with Clementine's moms where we take her one weekend a month and they take Athena one night a month. That has been the most awesome thing ever. Our first turn at that was thwarted by bad food truck lunch going to food poisoning. (Never again Takoz. Never again!) I spent that evening driving the porcelain bus instead of dancing. But the second time we made up for it by going to Indo for dinner, then heading to FNW for the 15th anniversary, staying til midnight, then getting up in the morning to head to Oakridge to catch Star Trek: Beyond and Ghostbusters, with lunch in between. It was crazy decadent. Also: Holtzman. Oh my goodness. So when we went to pick up Athena, she wasn't ready to go. She wanted to play with Clementine longer. Not once did I get the, "But I missed you so much when you weren't there last night Mommy." routine I'm so familiar with. Nope, no guilt trip. Pretty sure everyone is winning. On the weekend we had Clementine, we took the girls back to Lemos Farms. They rode ponies and bounced and rode the train and fed the goats. In fact, bouncing was the best, and the girls spent a one-hour stint in the bounce house without a break. On the way home, they took the nap of the truly tuckered out. Kevin and Rachel have been hosting some outdoor movies at their place. They had a night of My Neighbor Totoro and now Athena is well and truly acquainted with the joys of the Catbus. 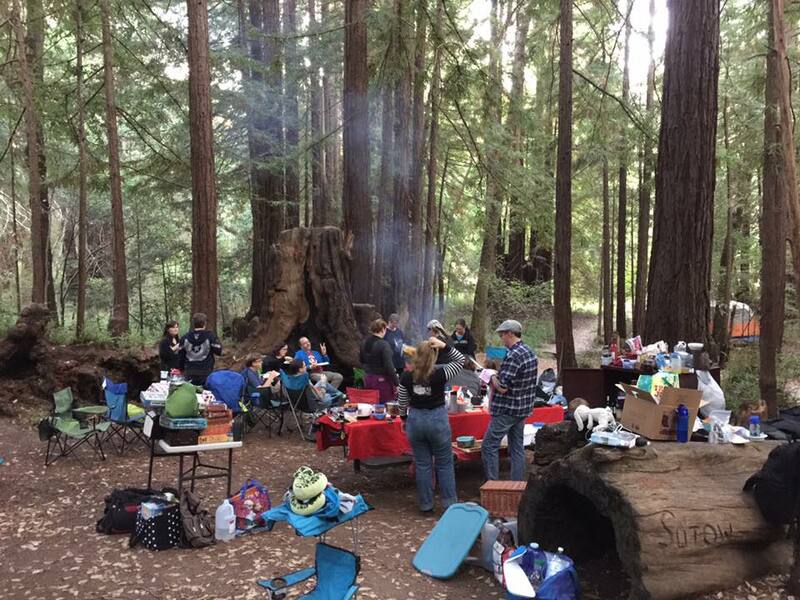 Kevin and Rachel also organized Gamer camping in Boulder Creek at Little Basin. 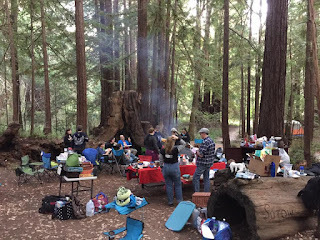 I had some concerns about trying to go camping without some days off to make it go well, but Erik really wanted to give it a go, so we went for it. 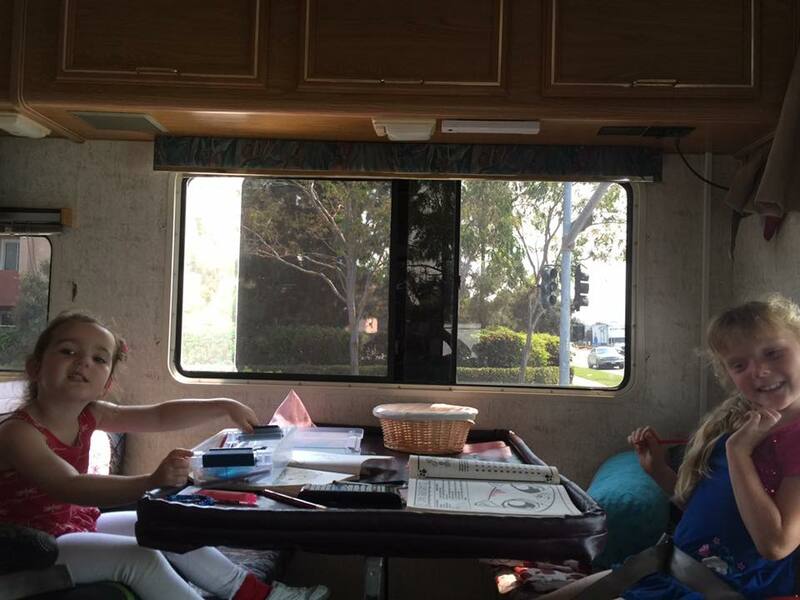 They headed up Friday afternoon with the Lendvays in their new/used RV while I finished my work day. Driving is way more fun with a table and activities. Unfortunately, I got there late Friday after work, after bad traffic, after stopping at home to pick up forgotten items, and Athena got really cold and slept poorly, climbing into our bed in the wee hours of the morning and proceeded to make snow angels while I teetered on the edge of the air mattress. By 6 a.m, I was done and moved toward the fire pit, but didn't see supplies to get a fire going, so gave up after a while and went and sat in my car and read. We gave Athena the choice of whether she wanted to stay another night with Daddy only, or come home with me. She wanted to stay, so I stayed til the end of the evening on Saturday and headed home. That ended up working out for everyone as that gave me a chance to reset her clothing, clean out too small shoes, pack her for the big vacation, and do a bit of quiet shopping at Target while she enjoyed another day of running around in the woods with Lorelei. 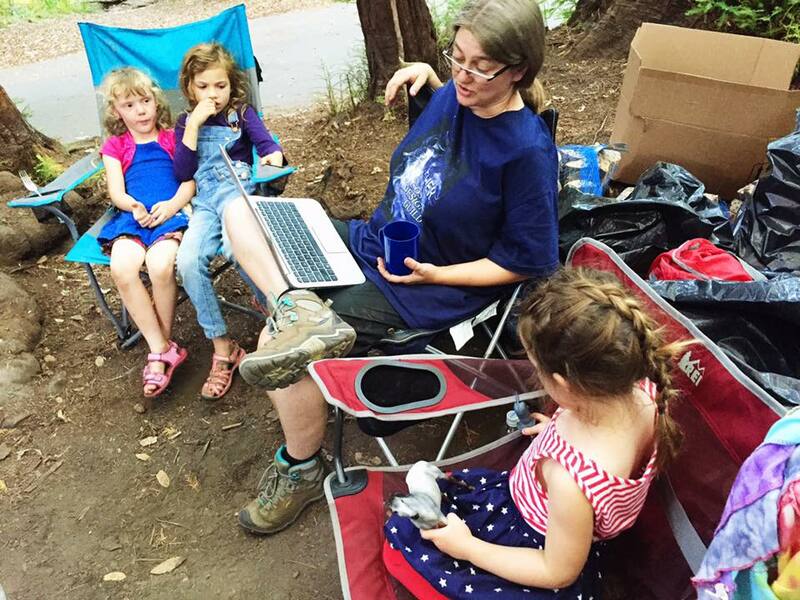 Crystal became the magical sparkly storyteller for the weekend, regaling the kids with stories of their choosing while they sat in rapt attention. It was awesome. 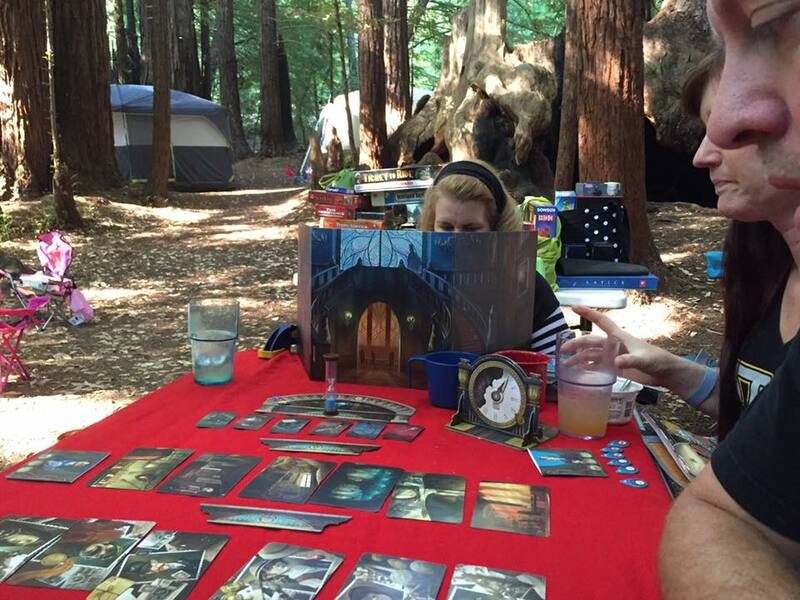 Meanwhile, we played games in the woods. I got to try out Mysterium, which is really pretty fun - similar to Code Names, but with images instead of words, as you are a ghost trying to communicate who murdered you from beyond the grave with very limited resources, and the other players try to guess as the mediums. 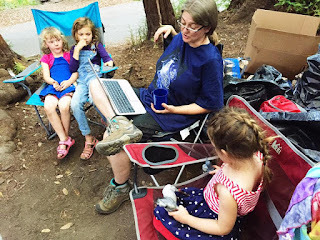 Last weekend we had an exceptionally busy time, having Clementine over, then adding in Lorelei too so that the Lendvays could see Star Trek: Beyond, then dinner, then met up with them and the Goris family at Gilroy Gardens the next day. 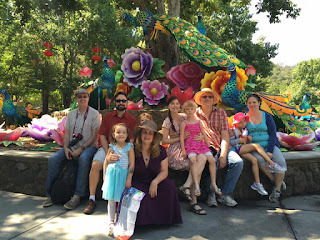 We'd never been to Gilroy Gardens before, and we were at once struck by how pretty it was and yet how not well-managed it was compared to our gold-standard of Disneyland. We spent over an hour to get to ride a swan paddleboat, but it only seated 2, so I stood out while Erik and Athena paddled the lake. Lots of other things were unexpectedly long waits for short rides, and I can't imagine the place on a busier day, but we had a nice time, especially in the water play area. Athena braved her first real water slide, splashing down into the pool. The first time she was super nervous and the lifeguard offered to catch her at the bottom. She came out and wanted to do it again immediately. The second time the lifeguard asked if she wanted to be caught, and she said, "No thank you!" Then she proceeded to wait in line to do it another half dozen times. Admission is included in our super-cheap Great America passes, so we'll probably head back one more time before those expire. I intended to get this published a few days ago, but didn't quite finish in time. Nevertheless, the next installment will begin with the grand adventure where Erik and Athena fly away to Boston to meet up with Karen and Rich and Maggie-dog. I dropped them off yesterday and Athena is having a blast. It's the first time she's flown since before she could walk, so the airports and airplane were a special treat. Plus: finally getting to see Meme's boat! And Maggie! Yay! It's been an interesting couple of months. About six weeks ago, Erik's colleague was called to jury duty. He mentioned this the day before he went off, leaving the department momentarily scrambling to cover his class that day. This was accompanied by the mild sense of forboding that comes with a call to jury duty: is this one day, or the start of something much bigger? Well, indeed, the colleague was called to be on the jury for the following four weeks. He didn't mention when asked that there might be consequences like there's no one to sub for things like Organic Chemistry and he had 90 students finishing the final four weeks of a year long cycle. He just figured he had to do it so he did. It wasn't til about ten days in that he started realizing what he'd done. For the first two weeks, Erik managed to cover teaching all of his classes and all of that guy's O-Chem. The rest of the department pitched in as they could to teach his Gen Chem classes. Then Erik had a conference to go to (and present at) and other folks had stuff come up, and suddenly classes were getting canceled right and left, material was being taught in a scattered and underprepared way, and he had little idea what they'd learned in order to write exams. I feel sorry for any of those students who have to go forward in a Chemistry or medical major. Yes, jury duty is a responsibility, but it's also your responsibility to speak up and say, "It would have this impact, and I could do this during my summer vacation instead and not harm anyone." But I'm also fairly certain he didn't want to lose his vacation time to jury duty so... things happened. This also meant that Erik was now teaching two additional days a week at 7:30 a.m., leaving me to get Athena to school four out of five days all on my own. I was displeased. There were birthdays! Erik and I are both May birthdays, so sometimes we opt for a party together and sometimes not. 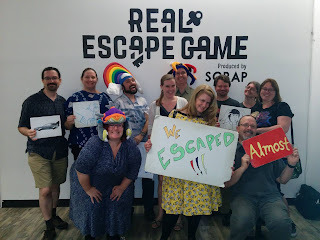 This year I organized an escape room game for his birthday at Ryptic in San Mateo. It was super fun and we got out with time to spare - 47 minutes! To make it extra fun, our GM was Mae Linh. It was a treat to get to see her (and Mike too!) outside of con. Of course Erik asked me a few days later, "So what do you want to do for your birthday?" I said, "Uh... well, the escape room was fun. Want to do that again?" So off we went to the Real Escape Game in San Jose for another thrilling adventure. Technically we didn't win, but we still had a good time and we'd figured it out, but we hadn't figured out the sole working solution the room would accept. This was followed with Mexican dinner at home and a few rounds of CodeNames. Now having played it a few times, we finally succumbed and bought a copy. We participated in the Tesla Family Fun Run. Here I learned that 5k sounds far, but it's actually less than I walk on a normal day. I also got to walk on our test track for the first time. It is steep. Cars go fast. Erik got to walk through the factory (and even see stamping in action!) and Athena rolled on her balance bike like a pro. Then there was a a bounce house and a helicopter and other fun stuff. We retired to Rubio's for lunch and promptly bumped into the Famdamily - Chris, Jen, Adam, etc. A tasty lunch was had and we headed home. 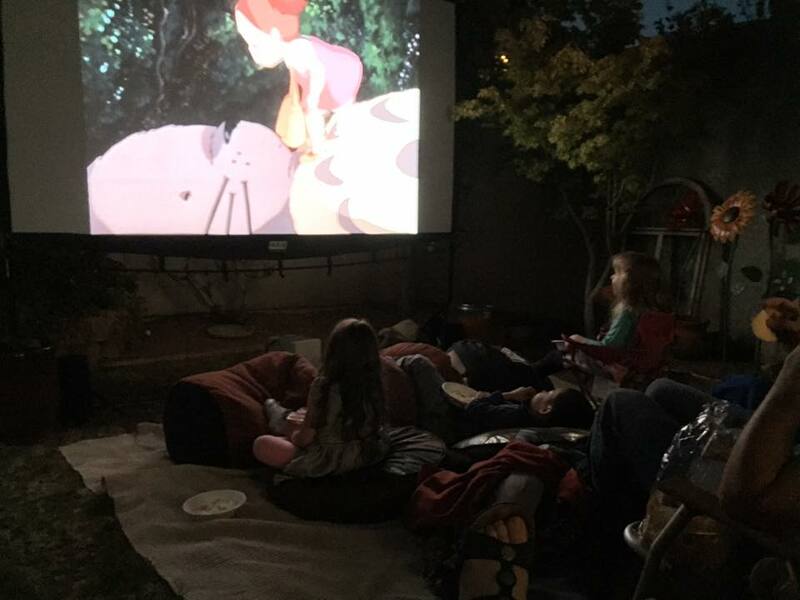 The Fox's have started hosting movie nights in their front yard. We opted to let Athena watch The Princess Bride with us. She's scared of shows with bad guys, so I was ready to eject at any time, but amusingly, the Peter Falk asides like, "She doesn't get eaten by the eels you know." actually helped break the tension for her. I could feel her start to tense up in my lap, and then he'd break the tension for Fred Savage, and it would work for her too. Totally awesome. The movie doesn't look the least bit dated. The only thing I notice now is how completely freaking useless Buttercup is. She's so bloody helpless it's painful. But, otherwise, it's still an amazingly perfectly delightful movie, and Athena liked it. Win! We went to Derby Day at the Hodges and enjoyed good times with mint juleps, large hats, and horse racing. I bet on a horse named Danzing Candy just because I loved the name. It was a treat to see their place and see Cliff and Debby. Their twins are now 4, and they've welcomed a new little boy to their home too because they're braver souls than I. 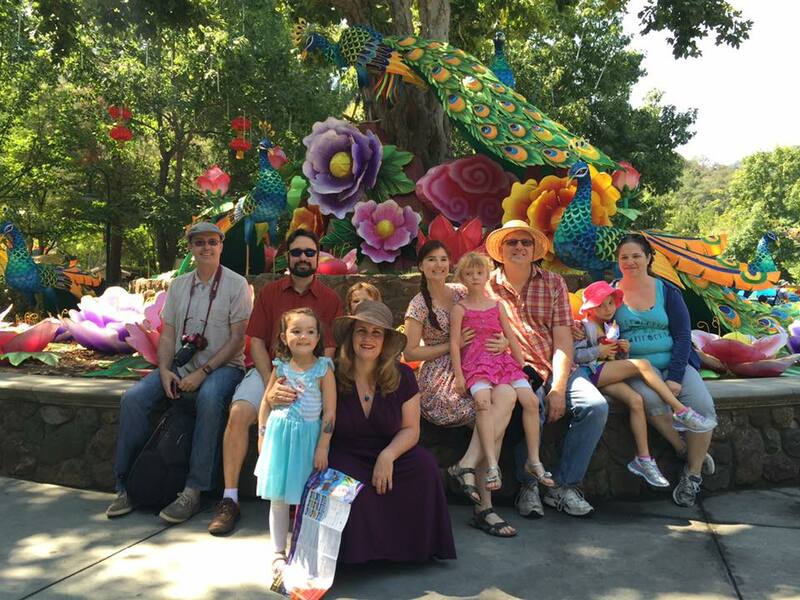 We hit the Sunnyvale Art & Wine festival on Sunday this year. We quickly found Athena Lendvay, who had both Lorelei and Connor in tow. We toured around and got them a couple rides and got faces painted for Lorelei and Athena. A few small purchases made and a trip through Target and we headed back home. That's when I realized my sunblock was totally inadequate. For whatever reason, the sun bit a lot of folks I know that weekend, and at least my burn was far less bad than James at work who dozed off on the beach in Santa Cruz. Still, sunburns are evil. Videotaping the choreography. Editing is still pending. Rachel's birthday party where we played games and took turns getting a massage from Serita. Going to see my former intern in Rent at SJSU. Cordelia's birthday party at Pump it Up, where I bounced myself senseless again, like you do. A run to Alameda for the Fezzi Cast Party, Pasta Night, and Arielle's birthday party. A night of Gent's and Estrogen combined, with dinner for 18 at Chevy's in Union City. The summer school session starts Monday. We're ready.